The Department of Justice filed a federal lawsuit on Monday challenging the $85 billion AT&T-Time Warner merger after concluding it would result in higher bills for consumers. "This merger would greatly harm American consumers. It would mean higher monthly television bills and fewer of the new, emerging innovative options that consumers are beginning to enjoy," Makan Delrahim, the head of the Justice Department’s antitrust division, said in announcing the suit, which was filed in U.S. District Court in Washington. “Absent an adequate remedy that would fully prevent the harms this merger would cause, the only appropriate action for the Department of Justice is to seek an injunction from a federal judge blocking the entire transaction,” he added. A Justice official explained that merging Time Warner's content with AT&T's distribution capabilities — internet, wireless and DirecTV — would reduce competition and innovation. The official argued the combined company would use its control in the industry to hinder its rivals by forcing them to spend hundreds of millions of dollars more per year to distribute Time Warner’s large swath of networks, like CNN, HBO and the entertainment channels TNT and TBS. The deal would also slow the industry’s change to new video distribution models, the lawsuit alleges. The combined company would have the incentive and ability to charge more for its content, department officials said. Some have expressed surprise that the Department of Justice would attempt to block a vertical merger, in which two companies merge that don't have directly competing entities. An agency official, however, said Monday that the government has been concerned about such mergers. "Some vertical mergers can be perfectly fine; some can be illegal,” the official said. The deal, and the Justice Department's handling of it, has attracted additional scrutiny because of President Donald Trump’s frequent criticism of CNN and of the proposed merger. Trump has repeatedly dubbed the network “fake news” and vowed during the 2016 presidential campaign to block the deal. A Justice Department official said Monday that the White House played no role in the agency’s decision and that the president's comments about CNN were not a factor. The economic analysis of the deal, the official said, did not include the actual content of such networks like CNN. "We cannot and we will not be party to any agreement that would even give the perception of compromising the First Amendment protections of the press"
“Vertical mergers like this one are routinely approved because they benefit consumers without removing any competitor from the market. We see no legitimate reason for our merger to be treated differently,” AT&T General Counsel David R. McAtee II said in a statement. "Fortunately, the Department of Justice doesn't have the final say in this matter. Rather, it bears the burden of proving to the U.S. District Court that the transaction violates the law. We are confident that the Court will reject the Government's claims and permit this merger under longstanding legal precedent." Randall Stephenson, AT&T chief executive held a press conference immediately after receiving the Justice Department lawsuit to argue the company's case. "I do want to address in the elephant in the room here: There has been a lot of reporting and speculation about whether this is all about CNN. And frankly, I don't know," he said. "But nobody should be surprised that the question keeps coming up because we have witnessed such a change in the application of anti-trust law here. "But the bottom line is, we cannot and we will not be party to any agreement that would even give the perception of compromising the First Amendment protections of the press. So any agreement that results in us forfeiting control of CNN whether directly or indirectly is a non-starter." Stephenson railed about competition from the tech giants, citing huge subscriber numbers of both Netflix, with above 100 million subscribers, and Amazon, which has an estimated 60 million subscribers, who also compete for viewers against AT&T's services that include satellite giant DirecTV, and DirecTVNow, an online video service. He warned competitors that the lawsuit could have grave ramifications for their proposed mergers saying that both small and large companies are now left with no guide posts. The Justice Department’s decision came two weeks after AT&T said it did not intend to sell CNN, or any other key assets to satisfy the agency’s demand for closing on the massive merger with Time Warner. Sources told NBC earlier this month that the Justice Department had told AT&T that it would have to sell one of its significant assets or one of Time Warner's (like Turner Broadcasting, which includes CNN) for the acquisition to be approved. 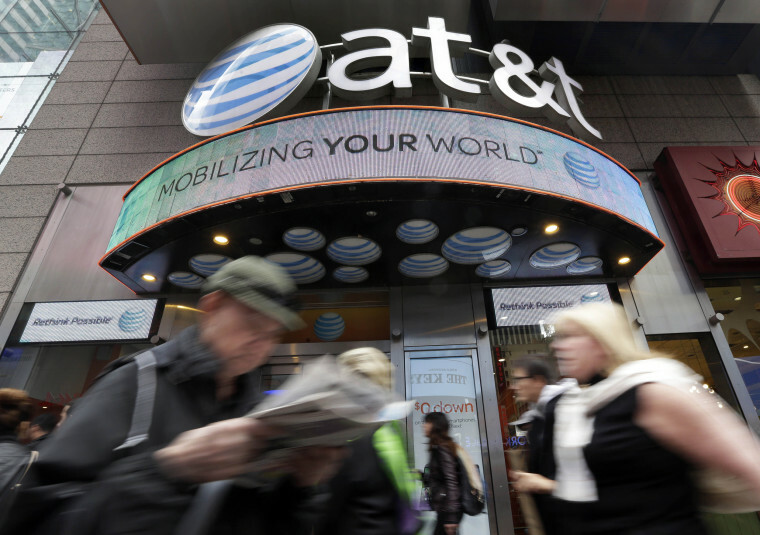 AT&T Chief Executive Randall Stephenson said, however, that the telecommunications giant would not make such a sale. Stephenson also said then that if there was no progress on negotiations, the likely result would be the phone giant heading to court to protect its planned acquisition and prevent any divestiture. AT&T has argued that because it would be a merger of a distribution company with a content company, there are no antitrust issues. Rivals have said AT&T may still exercise market power by potentially raising the price other distributors have to pay to carry Turner’s channels. AT&T and Time Warner have until April 22 to get a federal court to rule against the Justice Department. If that doesn’t happen, either party can walk away from the deal. Time Warner shares fell 0.4 percent in after-hours trading after closing the day down 1.1 percent. AT&T shares rose slightly on the news, increasing 0.5 percent in after-hours trading after closing the day up 0.4 percent. Pete Williams and Claire Atkinson contributed.